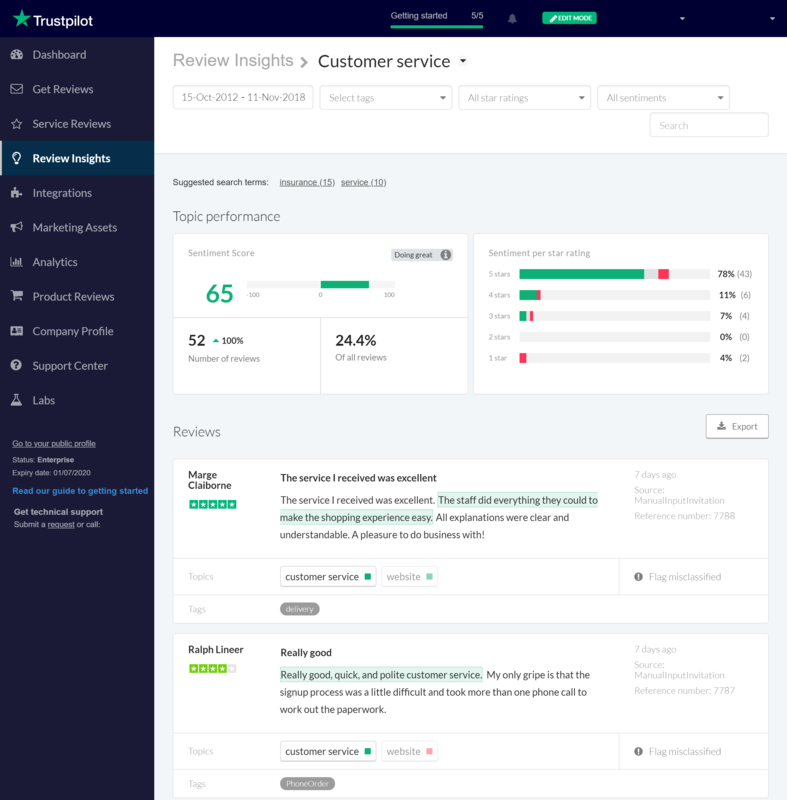 Review Insights provides you with dashboards that let you analyze your reviews, locate trends and monitor your customers’ sentiment about their experiences. This feature uses machine learning technology to automatically detect topics in your reviews as well as the sentiment of those topic mentions. To access these insights, go to your Trustpilot Business account and click on Review Insights on the left-hand menu. Click on any topic in the table to go to the single topic page where you can dig further into the performance of that specific topic. Doing great – A topic that the algorithm has identified as an overall positively performing topic in your reviews for the period compared to the other topics. Needs attention – A topic that the algorithm has identified as having a significant number of negative mentions in your reviews. Good to great – A topic that has a significant number of negative mentions found specifically in 4-star reviews. All labels are assigned based on automated calculations that take both sentiment distribution and review volume into consideration. Labeled topics should be taken as suggested focus areas. This section of Review Insights provides you with sentiment heat maps that show you the distribution of negative and positive mentions of your topics across 1- to 5-star reviews. You can use the heat maps to visually identify your strengths and weaknesses as well as points of friction where the overall sentiment seems to go against the star rating of the review, e.g. a topic with a lot of negative sentiment in 4-star reviews. Each cell in the heat map is clickable and takes you directly to the topic page filtered down to that specific subset of reviews. At the top of the page you can find a period selector as well as a tags filter. Here you can filter results by one of your own tags (read more about Trustpilot’s tagging system). Use a combination of tags and topics to, e.g. compare the sentiments of different segments of your customers, and to compare store performance or satisfaction with different products or service offerings. To help shape and define our topics we make use of a machine learning algorithm which goes through millions of reviews to find clusters of words related to a topic. This technique also allows us to pick up all the most common misspellings of topic-specific terms. When the algorithm detects a topic mention in the sentence of a review, we run that sentence through our sentiment model which labels the sentiment of the sentence as either positive, neutral or negative. The sentiment score for a topic is calculated by taking the percentage of positive mentions of a topic and subtracting the percentage of negative mentions, giving a score between 100 and -100. Our sentiment model is retrained periodically to become more and more accurate, so sentiment scores may potentially adjust over time. 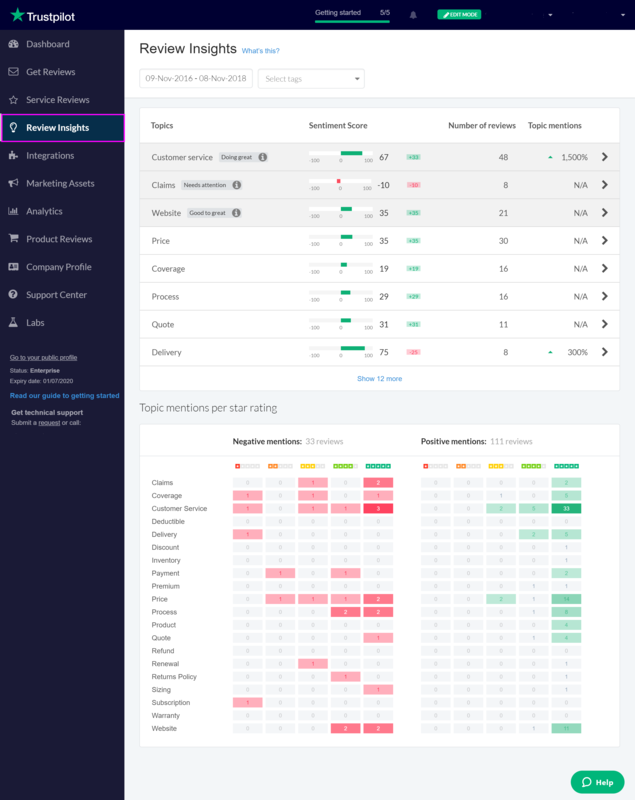 The single topic page is where you go to delve more into a topic’s performance, to find and monitor trends within a topic, and to identify actionable feedback that can improve your future customers’ experiences. Tags filter – Filter reviews for the topic by one of your existing tags. If you select more than one tag, the reviews will still only be filtered by one of the tags. For example, if you filter by tag A and B you will see reviews that have tag A, and reviews that have tag B, but you will not see reviews that have both tag A and B. Star ratings filter – Filter reviews for the topic by a specific star rating. Sentiments filter – Filter reviews for the topic by a specific sentiment. Free text search – Filter reviews for the topic by specific keywords. All these filters work in combination with each other, making it easy to filter down to e.g. 3- and 4-star reviews for the topic with a negative sentiment and a specific tag. Just below the filter you’ll find some suggested search terms. These terms are selected based on an algorithm that looks for words that are more unique to your reviews with the selected topic compared to all other reviews with that topic. When you click on a suggested search term, it is applied in the filter bar’s free text search. The suggested search terms update according to your filter selections. Be aware that the algorithm works best with larger volumes of reviews and the quality and number of suggestions might drop if you’re looking at a small subset of reviews. Here you can find a set of metrics and visuals related to the overall performance of the topic you are looking at. If you apply filters to the topic page, the metrics and visuals will update to match that selection. Sentiment score – The overall sentiment score for the selected subset of reviews. Number of reviews – The number of reviews matching the current topic, period and filter selections. This also includes an indicator of a rise or drop in volume compared to the previous period. % of total reviews – This metric compares the currently selected subset of reviews to your total number of reviews for the selected period. You can use this to help qualify the significance of the topics or any underlying trends you have found by using the filters. Sentiment per star rating – This bar chart shows you the distribution of topic mentions for the currently selected reviews across the different star ratings. The color of each star ratings bar also shows you the sentiment distribution of topic mentions within that star rating. Here you can find the list of reviews matching your current topic and filter selections. Use the Reviews section to find or validate trends in tone or review content, or to find the best review examples to illustrate the insights and trends you’ve identified. We highlight all the sentences in the review that our algorithms have associated with a specific topic. This makes it easier to skim through all your customers’ feedback on that specific topic. The color highlighting the sentence shows you the sentiment of the sentence, i.e. green for positive, red for negative. If a review talks about more than one topic, you’ll find several topic buttons beneath the review text. Click on the topic you’re interested in, and the text associated with that topic will become highlighted. On the left-hand side of each review, you’ll see the name of the reviewer and the star rating of the review. On the right-hand side, you’ll see the date the review was written and the source of the review, e.g. Automatic Invitations. If applicable, the reference number will be displayed. If you’ve added any tags to the review, you’ll find them below the topic buttons. Flag misclassified – This button allows you to inform Trustpilot if one or more of the automatic classifications for a review is incorrect. Your feedback helps us continually improve your topic insights and our sentiment algorithms (thanks!). Export – Above the Reviews section, you’ll find an export button. Click it to download your currently selected reviews as a CSV file, including topic and sentiment information. You can use the data to build your own reports and visuals. You can even combine the data with other data sources to broaden your customer knowledge even more.